To date, Avenged Sevenfold has released five studio albums, one live album/compilation/DVD, and eighteen singles and sold more than four million albums worldwide. The band was formed in 1999 in Huntington Beach, California with original members M. Shadows, Zacky Vengeance, The Rev and Matt Wendt. M Shadows came up with the name as a reference to the story of Cain and Abel from The Bible, which can be found in Genesis 4:24, although they are not a religious band. Upon its formation, each member of the band also took on a pseudonym which were already nicknames of theirs from high school. Before the release of their debut album, the band recorded two demos in 1999 and 2000. 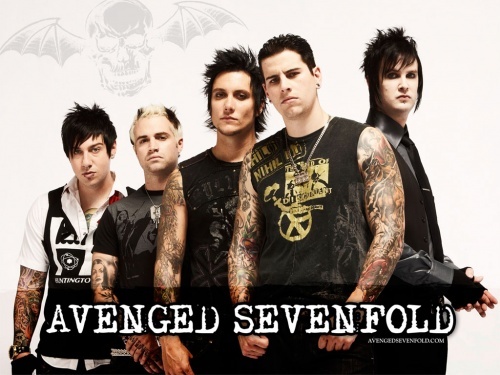 Avenged Sevenfold's debut album, Sounding the Seventh Trumpet, was recorded when the band members were just eighteen years old and in high school. It was originally released on their first label, Good Life Recordings in 2001. After lead guitarist Synyster Gates joined the band, at the end of 1999 when he was 18 at the introductory track "To End the Rapture" was re-recorded featuring a full band element. The album was subsequently re-released on Hopeless Records in 2002. The band started to receive recognition, performing with bands such as Mushroomhead and Shadows Fall and playing on the Take Action Tour. Having settled on their fourth bassist, Johnny Christ, the group released their second studio album titled Waking the Fallen on Hopeless Records in August 2003. The album featured a more refined and mature sound production in comparison to their previous album. The band received profiles in Billboard and The Boston Globe, and played in the Vans Warped Tour. In 2004, Avenged Sevenfold toured again on the Vans Warped Tour and recorded a video for their song "Unholy Confessions" which went into rotation on MTV2's Headbanger's Ball. Shortly after the release of Waking the Fallen, Avenged Sevenfold left Hopeless Records and were signed to Warner Bros. Records. City of Evil, the band's third album and major label debut, was released on June 7, 2005 and debuted at No.30 on the Billboard 200 chart, selling over 30,000 copies in its first week of release. It utilized a more classic metal sound than Avenged Sevenfold's previous albums, which had been grouped into the metalcore genre. The album is also notable for the absence of screamed and growled vocals; M. Shadows worked with vocal coach Ron Anderson—whose clients have included Axl Rose and Chris Cornell—for months before the album's release to achieve a sound that had "grit while still having the tone". The album received positive reviews from several magazines and websites and is credited for propelling the band into international popularity. They returned to the Vans Warped Tour, this time headlining and then continued on their own "Cities of Evil Tour. "In addition, their lead single "Bat Country" reached No.2 on the Billboard Mainstream Rock Charts, No.6 on the Billboard Modern Rock Charts and the accompanying video made it to No.1 on MTV's Total Request Live. Propelled by this success, the album sold well and became Avenged Sevenfold's first gold record. It was later certified platinum in August 2009. Avenged Sevenfold was invited to join Ozzfest tour on the main stage, alongside other well known hard rock and heavy metal acts DragonForce, Lacuna Coil, Hatebreed, Disturbed and System of a Down for the first time in 2006. That same year they also completed a worldwide tour, including the US, The United Kingdom (as well as mainland Europe), Japan, Australia and New Zealand. After a sixteen month promotion of City of Evil, the band announced that they were cancelling their Fall 2006 tour to record new music. In the interim, the band released their first DVD titled All Excess on July 17, 2007. All Excess, which debuted as the No.1 DVD in the USA, included live performances and backstage footage that spanned the band's eight year career. Two tribute albums, Strung Out on Avenged Sevenfold: Bat Wings and Broken Strings and Strung Out on Avenged Sevenfold: The String Tribute were also released in October 2007. On October 20, 2007, Avenged Sevenfold released their self-titled album, the band's fourth studio album. It debuted at No.4 on the Billboard 200 with over 90,000 copies sold. Two singles, "Critical Acclaim" and "Almost Easy" were released prior to the album's debut. In December 2007, an animated video was made for "A Little Piece of Heaven." Due to the song's controversial subject matter, however, Warner Brothers only released it to registered MVI users over the internet. The third single, "Afterlife" and its video was released in January 2008. Their fourth single, "Dear God", was released on June 15, 2008. Although critical reception was generally mixed the self-titled album went on to sell over 500,000 copies and was awarded "Album of the Year" at the Kerrang! Awards. Avenged Sevenfold headlined the 2008 Taste of Chaos tour with Atreyu, Bullet for My Valentine, Blessthefall and Idiot Pilot. They used the footage from their last show in Long Beach for Live in the LBC & Diamonds in the Rough, a two-disc B-sides CD and live DVD which was released on September 16, 2008. They also recorded numerous covers, including Pantera's "Walk", Iron Maiden's "Flash of the Blade" and Black Sabbath's "Paranoid". In January 2009, M. Shadows confirmed that the band was writing the follow-up to their self-titled fourth album within the upcoming months. They also announced that they will be playing at Rock on the Range, from May 16–17, 2009.On April 16, they performed a version of Guns N' Roses' "It's So Easy" onstage with Slash, at the Nokia Theater in Los Angeles. On December 28, 2009, drummer James "The Rev" Sullivan was found dead at his home at the age of 28. Autopsy results were inconclusive, but on June 9, 2010, the cause of death was revealed to have been an "acute polydrug intoxication due to combined effects of Oxycodone, Oxymorphone, Diazepam/Nordiazepam and ethanol". In a statement by the band, they expressed their grief over the passing of The Rev and later posted a message from Sullivan's family which expressed their gratitude to his fans for their support. The band members admitted in a number of interviews that they considered disbanding at this point of time. However, on February 17, 2010, Avenged Sevenfold stated that they had entered the studio, along with now-former Dream Theater drummer Mike Portnoy, to drum for the record, in place of the Rev. The single "Nightmare" was digitally released on May 18, 2010. A preview for the song was released on May 6, 2010 on Amazon.com, but was removed soon after for unknown reasons. Mixing for the album had been completed in New York City, and Nightmare was finally released worldwide on July 27, 2010. It met with mixed to positive reviews from music critics but was well received by the fans. Nightmare beat sales projections easily, debuting at number one on the Billboard 200 with sales of 163,000 units in its first week. After finishing recording, in December, Portnoy and the band posted simultaneous statements on their websites stating that he will not be their replacement for The Rev. However, Portnoy did travel with the band overseas in December 2010 for three shows in Iraq and Kuwait sponsored by the USO. They played for U.S. Soldiers at Camp Adder, Camp Beuhring, and Balad Air Base. On January 20, 2011, Avenged Sevenfold announced via Facebook that former Confide drummer Arin Ilejay will tour with them starting this year. Whether or not he will be joining the band on a permanent basis has not been decided yet. Avenged Sevenfold performed at the Rock am Ring and Rock im Park festivals on June 3–5, 2011 alongside other bands such as Alter Bridge, System of a Down, and In Flames. On April 2011, the band headlined the Golden God Awards held by Metal Hammer. The same night the band won three awards for "Best Vocalist" (M. Shadows), "Epiphone Best Guitarist(s)" (Synyster Gates and Zacky Vengeance) and "Affliction’s Album of The Year: " for Nightmare, while Mike Portnoy won the award for "Drum Workshop’s Best Drummer" for his work on the album. In May 2011, it was confirmed that the band had written a new song to be included in the Escalation DLC pack for the video game Call of Duty: Black Ops. The song is the first time developers Treyarch have commissioned an outside band to contribute a song since the franchise began. The song, titled "Not Ready to Die", was released on iTunes on May 2, 2011. Avenged Sevenfold headlined the 2011 Uproar Festival with supporting acts Three Days Grace, Seether, Bullet For My Valentine, Escape The Fate, among others. In August 2011, vocalist M. Shadows stated the band would finish the Uproar Festival, then go home to take a break for six to seven months before starting a new record. He also roughly stated that Arin Ilejay and the band are getting along great, but they have to make sure he's comfortable writing music with them, but he hopes everything works out. In November and December, 2011, the band went on their "Buried Alive" tour with supporting acts Hollywood Undead, Asking Alexandria, and Black Veil Brides. On April 11, 2012, Avenged Sevenfold won the award for "Best Live Band" at the Revolver Golden Gods awards. The band toured through Asia into April and early May, and played at the Orion Music + More, Festival on June 23 and 24 in Atlantic City, New Jersey alongside Metallica and Cage the Elephant among many others. On September 24, 2012, Avenged Sevenfold released a new song, titled "Carry On", which is featured in the video game Call of Duty: Black Ops II. The band has cited bands such as Bad Religion, Guns N' Roses, Iron Maiden, Pantera, Dream Theater, Megadeth, Metallica, NOFX, Alice in Chains, Black Flag, Corrosion of Conformity, The Misfits, Slayer, The Vandals, Rage Against the Machine, Korn, Deftones and AFI as their artistic influences. Avenged Sevenfold's material spans multiple genres and has evolved over the band's entire career. Initially, the band's debut album Sounding the Seventh Trumpet consisted almost entirely of metalcore sound; however, there were several deviations to this genre, most notably in "Streets" which adopts a punk style and "Warmness on the Soul," which is a piano-oriented ballad. On Waking the Fallen, the band displayed the contemporary metalcore style once more, but added more clean vocals as well as more mature and intricate musical elements. In the band's DVD All Excess, producer Andrew Murdock explained this transition: "When I met the band after Sounding the Seventh Trumpet had come out before they had recorded Waking the Fallen, M. Shadows said to me 'This record is screaming. The record we want to make is going to be half-screaming half-singing. I don't want to scream anymore. And the record after that is going to be all singing.'" On City of Evil, Avenged Sevenfold's third album, the band chose to abandon the metalcore genre, developing a more hard rock style. Avenged Sevenfold's self-titled album, again, consists of several deviations to less consistent genres and styles from the album's main hard rock and heavy metal songs, most notably in "Dear God", which adopts a country style and "A Little Piece of Heaven", which is circled within the influence of Broadway show tunes, using primarily brass instruments and stringed orchestra to take over most of the role of the lead and rhythm guitar. Nightmare contains further deviations, including a piano ballad called "Fiction" and a brief return to their metalcore roots on "God Hates Us" and "Not Ready to Die". The band has changed considerably since their first album, in which during that time they have been characterized as a heavy band with a screamed and growled vocal style combined with clean vocals, chugging guitar riffs and breakdowns that one can expect from the metalcore genre. The band members occasionally play instruments other than their primary instruments listed below. For a more comprehensive list, see Avenged Sevenfold discography. "Disneyland Acid Trip" was the original title of "Unbound (The Wild Ride)"
"Fast Melodic" was the original title of "Lost"
"Big Bear" was the original title of "A Little Piece of Heaven"
"Country Rocker" was the original title of "Dear God"
"I Don't Belong Here" was the original title of "Afterlife"
"Brompton Rock" was the original title of "Brompton Cocktail"
"Death" was the original title ofe "Fiction"
"Total Nightmare" was the original title of "God Hates Us"
"Military Death" was the original title of "Danger Line"
"Bad Men" was the original title of "Save Me"
"Avenged In Chains" was the original title of "Tonight The World Dies"
"Reagan Blast" fut le titre Original de "Natural Born Killer"
"Harvester" was the original title of "Lost It All"
"One" was the original title of "Buried Alive"
he group uses a logo called "Deathbat" ("Bat death" in French). It was created by a friend of the band, Micah Montague, as seen on the All Excess DVD. The Deathbat appears on the covers of all albums. Most of artworks have been created by Cameron Rackham, a close friend of group, but it is not he who drew the original. The Deathbat is sometimes shown as a complete skeleton with bat wings, as on the cover of City of Evil and Nightmare. This emblem has aroused so much enthusiasm that it is widespread, and is now associated as a symbol of the group. The success was such that many fans are easily the logo tattooed on the body.